The bandwidth sharing application is expected to lure millions of new people to the blockchain industry. BTT, the token behind the application, is listing on dozens of exchanges at the same time that TRON’s dApp projects continue to grow. Enhancing the entire TRON network, then, is an upcoming hardfork, which is expected to enhance the security and overall performance of TRON. 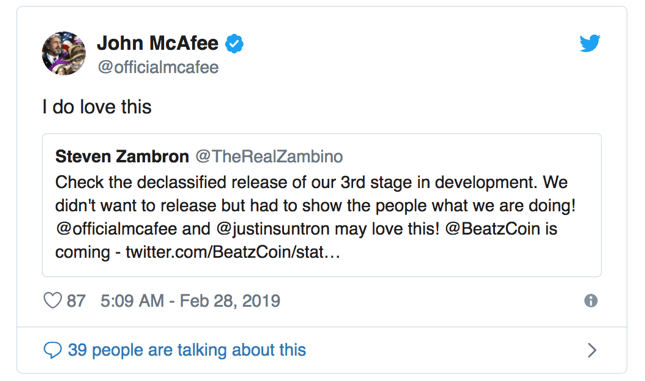 As stated, John McAfee has taken notice of TRON’s developments, but one venture has caught his eye in particular. The crypto bull expressed his adoration for the TRON VibraVid platform, saying “I do love this” in a Twitter response to the platform’s team. VibraVid is an upcoming decentralized content sharing platform, “a decentralized answer to the industry giants like YouTube.” Powered by BeatzCoin (BTZC), the platform gives content creators a way to upload, market, and sell their content to fans or users. BTZC tokens are exchanged between artists and consumers directly, for the use of digital content. The idea is that the entire platform will act as a hub for artists such as musicians, who can control and monetize their works. >> Facebook Coin Rumors Continue to Circulate: What’s the Truth? Clearly, John McAfee gets behind artists controlling their own assets on these types of sharing platforms. TRON is the 9th largest cryptocurrency by market cap. At the time of writing, TRX is trading at $0.023 USD per coin according to CoinMarketCap. Are you a fan of TRON? Do you think TRON’s VibraVid platform will be successful?